Everybody loves waffles, and everybody loves tacos, so why not combine the two?! Chocolate-dipped, strawberry ice cream-stuffed tacos are not only the perfect snack to satisfy a sweet tooth craving, but they're also a great centerpiece or dessert item for kid's birthday parties, summer get-togethers, and after-work parties. Top these choco tacos with some hazelnuts and call it a day! 1. First, make the ice cream. To do so, purée the strawberries and set aside. Add the condensed milk to the whipping cream and stir until it becomes stiff. Add in the strawberry purée and mix well. 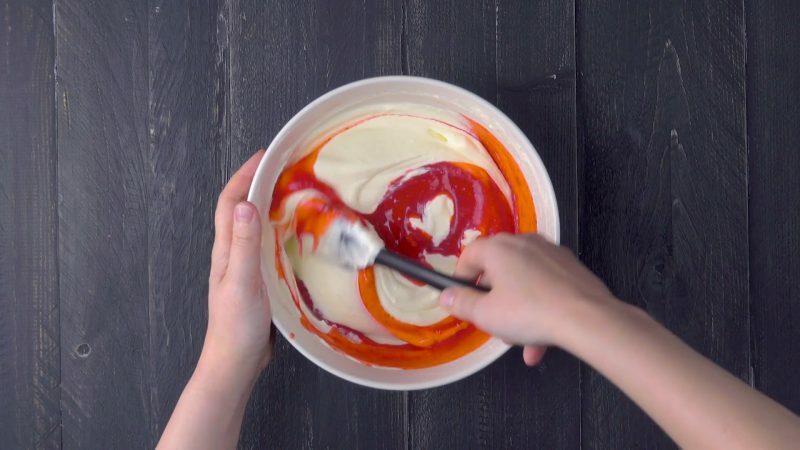 Pour the mixture into a loaf pan, smooth out the top, and freeze it. 2. Place a metal colander inside a boiling pot of water. 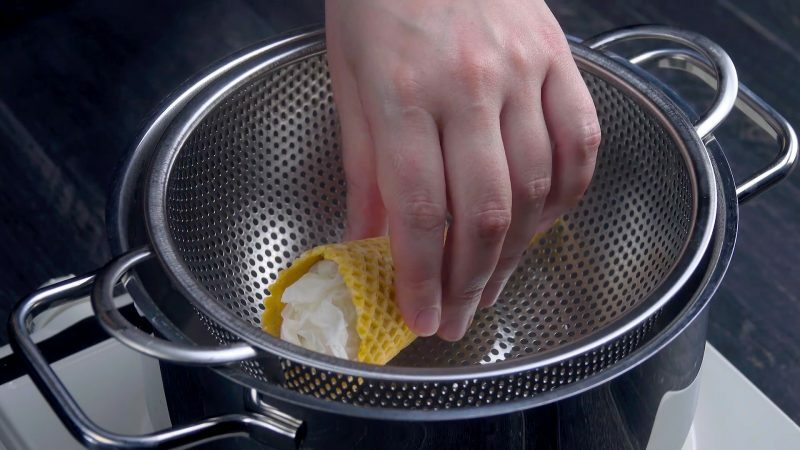 Put a damp cloth, such as a paper towel, inside the waffle cone and place the cone inside the colander. Cover the pot with a lid and let the cone sit for two to three minutes. 3. 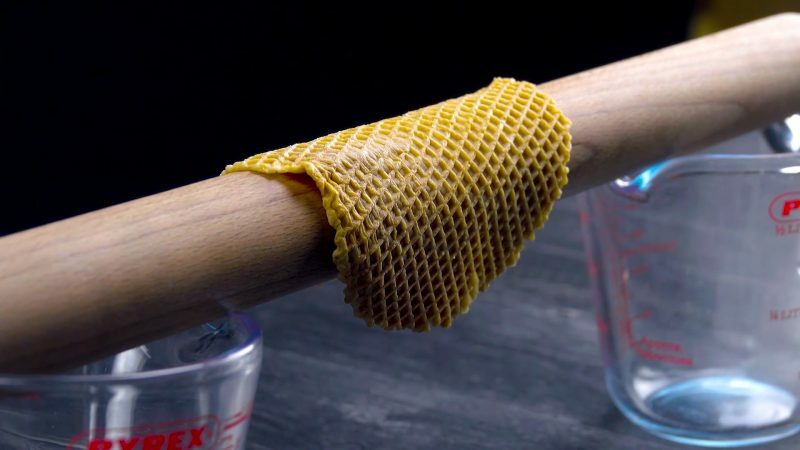 The steam will cause the waffle cone to unfold. Remove the cone from the colander and drape over a curved surface, such as a rolling pin. Let the cone air-dry until it has taken on its new shape. 4. Stand the sweet taco shell upright or hold it in your hand and completely fill the inside with the strawberry ice cream. Make sure to smooth out the round edges. 5. To turn the ice cream taco into a chocolate taco, dip the edge of the waffle taco into the melted chocolate. Make sure to fully cover the exposed ice cream with chocolate. Finally, sprinkle chopped hazelnuts onto the chocolate before it hardens. 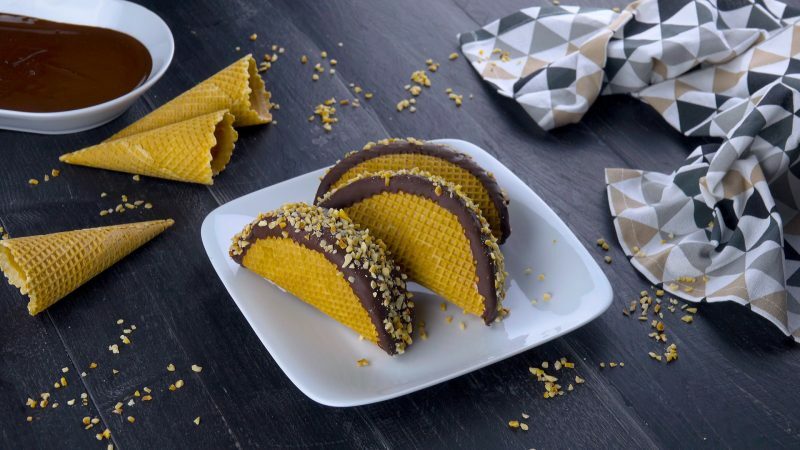 Now make as many ice cream-filled chocolate tacos as you like or as long as your ice cream and sweet tacos hold out. There are many different variations you can try as well. For example, try switching up the ice cream flavors, types of melted chocolate, and which toppings you choose to sprinkle on top — the sky is the limit!